Joe Rosselli's outing was good enough to earn praise from his manager. That was because Rosselli was good enough that day in May 1995 gave up a single run, pitching into the sixth inning, according to The Los Angeles Times. This was also Rosselli's first major league start. "I was definitely nervous," Rosselli told The Times, "but after the first hitter I kind of said, 'I have to calm down and get some hitters out.' 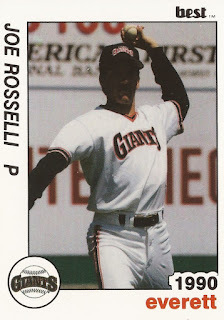 "
Rosselli debuted with the Giants that year in his fifth season as a pro. The extent of his major league career was also contained in that fifth season. Rosselli's career began in 1990, taken by the Giants in the second round of the draft, out of Bishop Alemany High School in California. Rosselli started at short-season Everett, moving to single-A Clinton in 1991. For 1992, he pitched at high-A San Jose, going 11-4 in 22 starts. He made AA Shreveport for an abbreviated 1993, then got his first look at AAA Phoenix in 1994. Then, late in April, just before the delayed season began, Rosselli got word from his manager Dusty Baker, he'd made the big club. "He said he was sorry it had to be this late in spring," Rosselli told The San Francisco Chronicle. "I'm happier than I've ever been in my life." Rosselli debuted April 30 in a relief outing, going 2.1 innings and giving up a run. He then picked up two starts for the Giants in May, then three outings in July. He picked up his final three outings to finish the year. In one of those outings, Rosselli gave up four runs in two innings of work. In his last, he gave up six runs in 2.1 innings. In between, he went three innings, giving up no runs. "I want a chance to show myself again, and show that wasn't the real me out there today," Rosselli told The Chronicle after the four-run outing. "It's frustrating. You want to redeem yourself, but you have to wait until your next outing." Rosselli played just one more season, with the Angels at AAA Vancouver, ending his career.